Personal Trainer Dubai Price – What is the going rate? Personal Trainer Dubai price fluctuates with the trainer’s experience and qualifications. Some are quite expensive whereas some are cheaper. Some have more experience and some are new in the industry. The prices for different levels are different. If we go for a quite experienced personal trainer, his/her rate will be higher. If we go to the one with higher qualifications, his/her rate will be higher. If we go with the rating on the personal trainer website, their prices will vary. Whenever you feel like hiring a personal trainer, do ask for a free consultation. Many of the personal trainers in Dubai provide a free consultancy that helps the clients to get into an opinion of hiring the personal trainer that understands his/her goals and body type. There are different prices for different trainers as we discussed above. We have enlisted various personal trainers for you so that you can go through each one of them and see why they vary in prices. There are usually two types of personal trainers – one who work as freelancers and the other who works for a company. Freelance personal trainers do not have office or gym. They work as a freelancer and train the clients at their chosen locations. They are quite flexible with the locations. They have different prices than a company’s personal trainer but the prices do not differ much in prices. The company based personal trainers are hired through the company and the price is set by the company, not the trainer. The personal trainers who are specialized in a specific subject are charged higher as they include the premium fee for their services. They charge more than normal Dubai personal trainers and also offer more services than that of company’s personal trainer or freelance personal trainers. They charge more because they spend money on themselves to enhance their skills. 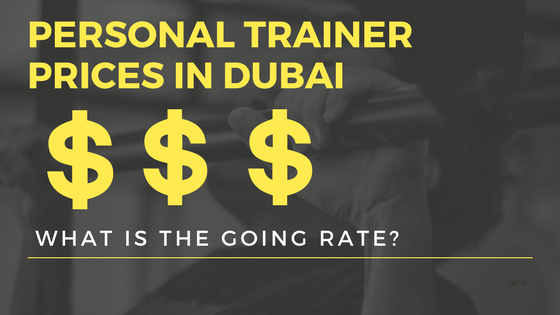 The personal trainers in Dubai charge more as their experience is increased. It is obvious that experienced trainers charge more than a new one as they have much more training skills that other personal trainers have. Some of the personal trainers become legally qualified for the training services and techniques. They can, therefore, register themselves with the regulatory professional services. Having membership of these professional service makes them charge more for their services. In order to get legally qualified they have put a lot of efforts and for this reason, they charge more for their training techniques and services. When we get into a shop, we pay extra for the overhead expenses. Similarly, personal trainers with on-going personal development charge extra for their overhead services. They not only charge extra but also train the clients with the upgraded methods of training. They use new techniques of training people for better results. And for these services, if they charge a little extra, that is affordable. Some of the trainers offer discounts at advance booking of the set of sessions. Suppose one sell his/her service at 200AED an hour, if a person buys an hour session, it will cost him 99AED and if he buys it for 10 or 20 hours then it can be discounted. This is how the pricing of personal trainers run in Dubai. If you are looking for a personal trainer, choose the best that is qualified enough and have the required skills and techniques to train you. You must have to look into his/her specifications and pricing details to know what services are he/she offering and what techniques and training is he/she going to provide and the services he/she offers can accomplish your fitness goals. UAE Personal Trainer Pricing - hover over me! Discount applicable to overall price can drop by up to 40% if taken in bulk sessions. For example, expect that a 3-4 year personal trainer can charge 350AED per session, this means that for a session usually hourly they can help you train and set you up with a meal plan. However, with one class you will not achieve much so the best practice is to take them in bulk. If you take let’s say 10 sessions then the price can be offered at 250AED as opposed to 350AED and if you take a total of 20 sessions than this can be reduced further. We offer a marketplace to save you time searching and scrolling endlessly on social media and different sites. We’re a health and fitness marketplace, dedicated to making your search for a personal trainer simple and easy! We allow you to filter through a list of personal trainers according to location, pricing, gender and around your availability and your book online. All you have to do is show up to your session. You can keep track of all your bookings and payments conveniently from your dashboard. If you have any quesitons, you can message the trainer directly on the site, just be sure to sign up to do so!